In a competitive field overflowing with less-than-svelte sports cars, therein shines Toyota 86, a stylish 2+2 rear-wheel drive coupe adhering to the fundamentals of automotive athleticism: optimal power-to-weight stats, a cunning design, superb balance and feel. In 2019, 86 sheds none of its distinguished moxie, and gains an even sharper edge through its newest grade: the limited production, 86 TRD Special Edition. 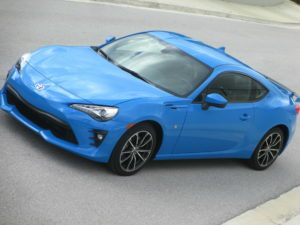 Two existing grades – 86 and 86 GT – complete the 86 range, and offer a wide variety of standard amenities, including the choice of a six-speed automatic or manual transmission. If USDA Certified Organic had a sports car category, the 2019 86 TRD Special Edition would be its benchmark. It’s the “purest of the pure” 86 ever offered in North America, which means it’s the best-equipped version for tracing a favorite canyon road, or for clipping circuits’ challenging apexes, time and time again. Essential to this cunning performance are its all-new SACHS dampers, 12.8-/12.4-in. front/rear Brembo brakes, and exclusive 18 x 7.5-in. alloy wheels wrapped in sticky Michelin Pilot Sport 4 tires (sized 215/40R18 85Y all around). The SACHS dampers further sharpen the 86’s steering response and refine vehicle stability. Extra-large four-piston front, two-piston rear Brembo brakes composedly cull speed at a moment’s notice, and enrich the 86’s well-balanced cornering prowess. Its Michelin Pilot Sport 4 summer tires turn up the grip factor while aiding steering reactiveness and boosting tactility communicated through its small-diameter steering wheel. Exclusively painted in Raven, and accented by a classic TRD tricolor graphic and TRD body kit (which include front bumper, side sills, rear bumper/diffuser, and spoiler), the TRD Special Edition looks the business. 86 TRD Special Edition also comes equipped with a standard TRD exhaust having brushed stainless steel tips. Opening the doors reveals a new red and black-trimmed telescoping steering wheel with red contrast stitching; red and black sport bucket seats with side bolsters; Granlux suede-like covering atop the instrument cluster; “TRD” logo embroidered on passenger side instrument panel; red contrast stitching throughout; and red seatbelts. Production will be limited to only 1,418 units. 86 TRD Special Edition models are only available with a six-speed manual transmission. A premiere automotive resource featuring video reviews by America’s top automotive critic Steve Hammes. Having road tested more than 2,000 new vehicles, Hammes, known as “The Go-to-Guy Before You Buy”, delivers at least two new reviews of his first-hand test drive experiences each week.